The US state of Massachusetts has two sets of early learning standards – one covering children aged from zero to 2.9; then another from that age to 5.5 years. Educa includes both guideline sets for linking to observations, plans and/or teacher reflections. 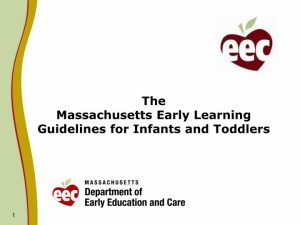 The Massachusetts Early Learning Guidelines for Infants and Toddlers (download here) gives a comprehensive view about the infants’ and toddlers’ development and documents experiences supporting that. The 206-page latest version, released in May 2011, can be downloaded here. It covers learners up to age 36 months. The guidelines focus on relationships between all significant people in the child’s world. As well, the document was developed noting the importance of males’ and females’ interactions with children. The guidelines have also been translated into Spanish – that’s part of the guidelines’ aim to support dual-language children and families. The guidelines cover separate sections for infants (birth to 15 months); toddlers (12 months to 36 months) and best practices. It goes into depth about children’s development in the areas of socio-emotional, language, communication, cognitive, physical health and wellbeing. Create a learning continuum linking early education and care to later success in school and life by aligning guidelines for infants/toddlers/preschool and the kindergarten curriculum frameworks. Learning is embedded in the child’s culture. Young children learn best through a comprehensive, whole-child approach integrated in culturally meaningful experiences. As for children aged 2.9, they’re considered to be preschoolers, which is when the Guidelines for Preschool Learning Experiences come into play. Educators use these to plan and evaluate curriculum for children in preschool and kindergarten. The guidelines have been operating since 2003 and detail guided learning in English language arts, mathematics, science and technology/engineering, history and social science, health education and the arts. It also gives adaptations for children with disabilities. EEC Learning Standards and Curriculum Guidelines focus on helping educators meet children’s needs including supporting social, emotional and academic development. Development domains (language, cognitive, socio-emotional). In 2016, the Board of Early Education and Care approved the WIDA Early English Development Standards (E-ELDS) for children aged 2.5 to 5.5 years and the Social and Emotional Learning and Approaches to Play and Learning Standards (SEL/APL) for preschool and kindergarten children. These are available in multiple languages. The E-ELDS aligns with WIDA K-12 Standards to serve dual language learners and corresponds to the Early Learning Standards. You can download the Dual Language Education Policies and Guidelines here (issued June 2010). Also, the E-ELDS aligns to the K-12 ELD Standards framework. This means it works in with the latter’s components. 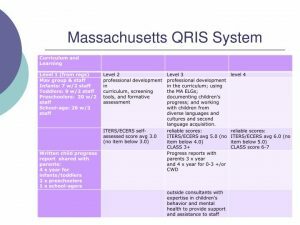 The Massachusetts Quality Rating and Improvement System (QRIS) came into force in March 2011. It’s a framework to organise the functions of the early childhood and afterschool care systems and covers career ladders, financial incentives, professional development and technical assistance. The QRIS is voluntary and has four levels – one to four. Level 1 is awarded to center-based providers of childcare licensed in “good standing” or who meet the licensing requirements if legally exempt. Find out more about the rating levels and assessment levels here. *Note: Educa includes the Massachusetts Early Learning Guidelines for Infants and Toddlers and the Massachusetts Guidelines for Preschool Learning Experiences by default. Early learning programs in MA can simply check a box to enable one of both frameworks for their center to support planning and documentation requirements.